• PLOT SUMMARY: How has the Avengers roster divided in the wake of CIVIL WAR? What are the full capabilities of Iron Man's armor? Who is the mysterious new Ronin? Why does the Black Widow look so young? How do the gods of Mount Olympus fit into the modern-day Marvel Universe? And just how many costumes has the Wasp had, anyway? 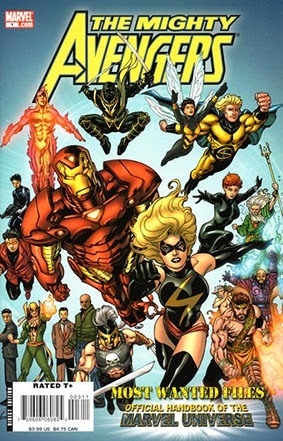 All these questions and more are explored in this year's AVENGERS HANDBOOK - spotlighting Avengers such as Ares, Ms. Marvel and Wonder Man; allies such as Maria Hill, Daisy Johnson and the Olympians; enemies such as the Collective, Viper and the Yakuza; and more! Featuring more technical diagrams by fan-favorite OHOTMU illustrator Eliot R. Brown! Written by SEAN MCQUAID, JEFF CHRISTIANSEN, ANTHONY FLAMINI, MICHAEL HOSKIN, MARK O'ENGLISH, STUART VANDAL, RONALD BYRD, MADISON CARTER & CHAD ANDERSON. Cover by AARON LOPRESTI.